This is a firestorm running through the bullion market as we speak. This is highly problematic because it came from a reputable dealer, in supposedly one most trust places on Earth to purchase bullion on a bar that was manufacturer by a old Swiss shop and to top it off, it had it paperwork including serial numbers. With the amount to currency debasement happening worldwide, this does not bode well for people using Gold as a wealth reserve asset. I bet GE is getting many orders for their ultrasound machines right now as people are auditing stocks of gold to see of they are affected. It will be interesting to see if the gold price starts to rise if more cases are reported to the public? Bitcoin is another value unit that has come on the scene and after reviewing the price charts seems to be increasing at a bullish pace. It was non-existent a few years back but something has shifted and people seem to have confidence in this exchange unit or whatever you want to call it to the fact is trades currently over $12 and it has had a top at over $30 in 2011. Interesting times we live in. Zero Hedge -It is one thing for tungsten-filled gold bars to appear in the UK, or in Germany: after all out of sight, and across the Atlantic, certainly must mean out of mind, and out of the safe. It is interesting that we are getting a peek into how a dictator actually operates. 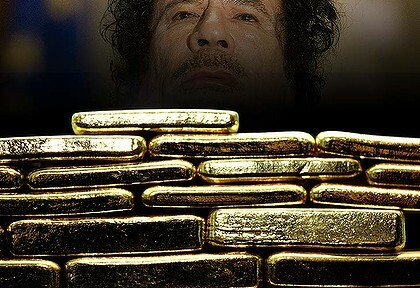 Gaddafi controls the Egyptian Central Bank and their depositary institution with 143 tons of gold bullion as a reserve for the Egyptian Pound. It is reported that this has been moved from Tripoli to another city in the country. This gold has a spot (street) value of over $6.5 billion dollars. Have this hard money available to him will give the Colonel staying power and allow him to continue to cling to power in Egypt. This will put confidence in the Egyptian capital markets in question. When such a large asset that was tied to the core function of backing the currency is removed, this will ripple through the markets and increase financial transaction costs in Egypt across the board. We have already seen a increase in yields for bonds that are tied to Egypt. It is reported on Bloomberg TV that their is a no-kill order on him so this allows for a stalemate where he is not killing civilians and does not leave the country either. If that happens then the country has been effectively annexed with loyal forces to the east and independent force to the east. I don’t think we will let it come to that and we will find ways to turn up the pressure on him on different fronts. The Sydney Morning Herald – Libyan leader Muammer Gaddafi is reportedly sitting on a 143.8-tonne $6.4-billion pot of gold – enough to pay mercenaries to fight for him for years. The gold bullion – held by the Libyan central bank and controlled by Colonel Gaddafi – is among the 25 largest reserves in the world, the Financial Times reported, citing the International Monetary Fund. This short article sums up the fear portion of the current gold trade. What the article fails to address is the massive amount of global quantitative easing (money printing) going on right. This is driving bond real interest rates to the floor. People see this happening and are taking notice. This is environment you want to preserve your purchasing power and not try and fight the central bank while they bail out their counter-parts (aka: commercial and investment banks). 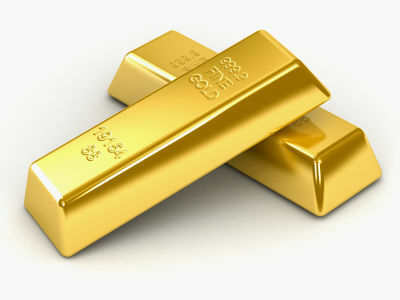 We are going to see much higher gold prices and I am looking for $2200-2400 by the end of 2011. With the amount of liquidity in the financial system, I think we will see a knee jerk reaction in asset prices and they will spike and we will see gold leading the way by the smart money. 2011 will be a year to learn much, many programs are going on and many theories are being put to the test, we will see if “this time is different?”. Investor Chronicle – Uncertainty abounds, with ongoing concerns over eurozone sovereign debt, nervousness in global financial markets, and the potential for increased concern over deflationary pressures. In the current economic and global-political environment, we see potential for gold to re-test all-time highs, above $1,424/oz (£903.32) and push to $1,500/oz in early 2011. Dan Burrow wrote a very simple and concise article laying out the case for a doubling of the price of gold from is current price that is hovering around $1,220.00 per ounce. Focusing on the driving factors like money supply growth and inflation expectations are based in solid logic for this move. Geo-political risk is another factor that was not mentioned. With the tensions in Korean, Israel and Europe, those situations drive fear higher. When fear and uncertainty rises, people seek safer havens for their wealth and gold has been the de-facto standard for thousands of years for just that. Another point that has not been getting as much press but is still very relevant is declining mine productions around the world. Most of the large deposits are giving diminishing returns and are require you to dig deeper and deeper into the earth. Bottom-line is that it is a safe bet that gold will drive higher from here. Mr. Paulson is not just talk but he is putting his and investors money where their proverbial mouth is. These last couple days, gold has tried to sell off just to see it come back strong and eek out a small gain each day. Even silver jumped over $1.00 in the same period. The key is too see if the Dow Jones can make news highs, if it does not then we could be seeing a top and then a decline. At this point it looks like the path is only higher for gold. Seeking Alpha – John Paulson, lionized by many investors for his winning bet on the fall of the housing and financial markets, is now getting aboard the gold wagon. The hedge fund manager told his investors that even at $1,150 an ounce, the bull run on gold is just beginning, according to the Wall Street Journal. His firm, Paulson & Co., plans to launch a fund January 1st dedicated to gold mining shares and other bullion related investments, the newspaper reported. Mr. Paulson, who is estimated to be worth about $6 billion. His bet against real estate and banks between 2007 and 2009 reportedly netted his hedge fund about $20 billion.